Southeast Asia has 350 million internet users across its six largest countries — that’s more than the entire U.S. population — and the latest data suggests its internet economy will reach $72 billion this year, up from $50 billion last year and $19.1 billion in 2015. Online travel accounts for the majority of that revenue ($30 billion) ahead of e-commerce ($23 billion), online media ($11 billion) and ride-hailing ($8 billion), and that rough breakdown is likely to be maintained up until 2025, according to the report. Indonesia, the world’s fourth largest country by population, is forecast to hit $100 billion by 2025, ahead of Thailand ($43 billion) and Vietnam ($33 billion), with strong growth forecast across the board. Indonesia and Vietnam, in particular, have seen their respective digital economies more than triple since 2015, according to the data. This year’s Google-Temasek report includes more detail on ride-hailing, which has become a particularly fascinating space in Southeast Asia since Grab acquired Uber’s local business earlier this year. Grab and its close rival Go-Jek, which is expanding from its base in Indonesia, have seen the market grow considerably, according to the report. Daily ride-hailing users in 2018 are up to eight million from 1.5 million in 2015, with monthly users growing to 35 million from eight million during the same time period. Growth in revenue is actually coming faster for food delivery services over core transportation services, which is a good sign for Grab and Go-Jek since the two businesses have aggressively expanded into additional on-demand services. Singapore, while the smallest of Southeast Asia’s six largest economies with a population of 5.5 million, has an outsized share of the region’s ride-hailing market — and that’s forecast to continue to 2025. Speaking of outsized, the report sheds some light on how the region’s largest companies utterly dominate its funding landscape. Billion-dollar companies in Southeast Asia sucked up $16 billion of the $24 billion invested in the region of the last four years, with Grab alone responsible for $6 billion of that figure. Every edition of the report has stressed that the growth forecasts are contingent on requisite levels of funding, boosting the Southeast Asian startup ecosystem as a whole, so the fact that most capital is going to a few very big players is a concern. 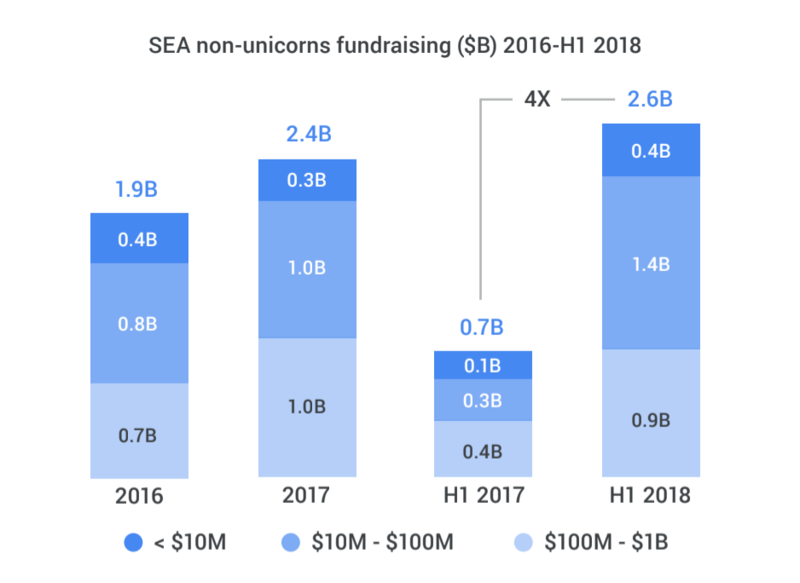 However, the report does show there has been progress from the rest of the field, with non-unicorn funding in the first half of 2018 reaching more than the total for the whole of 2017. “More than 2,000 internet economy companies in the region have secured investments, with companies valued less than $1 billion able to raise collectively almost $7 billion in the last three years. Among them, the most dynamic segment was that of companies valued between $10 million and $100 million. The bedrock of the internet economy, these companies have raised $1.4 billion in the first half of 2018, already eclipsing the $1.0 billion they received in all of 2017,” the report states.